Escape! 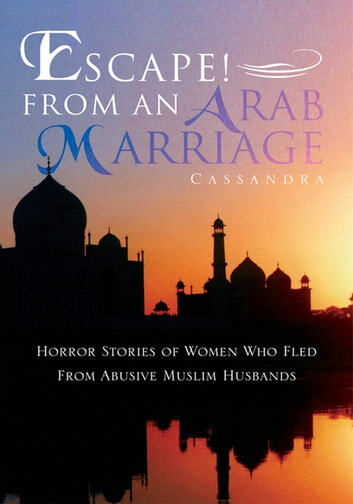 From An Arab Marriage, Cassandras first book, includes her personal story and documented stories of other women who became involved with Arab/Muslim men who have come from the Middle East. The women in these stories have learned firsthand the truth of how women are thought of in Islamic societiesthat 6th century traditional abuse and cruelty toward women, alive and well today, is still an everyday part of married life to an Arab/Muslim which includes abduction of any children to countries such as Saudi Arabia where they are forced to remain and where their heartbroken mothers can never see them again or bring them home. Also included in this book is a list of Islamic characteristics of marriages to Arab/Muslim males and of premarital relationships virtually every woman who becomes involved with these individuals inevitably finds herself facing. Not only has Cassandra herself had to survive such an environment, every person whose story is in this book has been the victim of a nightmare relationships she did not realize could exist in real lifeand that this is only the tip of the iceberg. There are many such stories which are never told because the women are too ashamed, too beaten down, or too afraid to tell anyone for fear of dire consequences for themselves or their children. I enjoyed reading the experiences of these women however editing leaves a lot to be desired. Editing was very poor.